HL700 Shiploader is standardized for fixed shiploading applications. 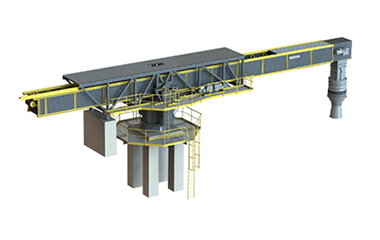 HL700 Shiploader is a slewing, shuttling and luffing type shiploader standing on its own foundation. It is fed by a belt conveyor. 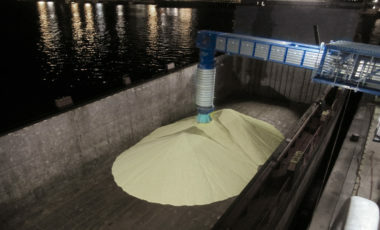 Design offers accurate loading of the material due to flexible operation of the boom conveyor. HL700 Shiploader is suitable for limited space quay. It requires no rails, wharf conveyor and cable reel. The fixed shiploader presents a cost-effective alternative to rail mounted shiploader. Relocating of the vessel can be avoided by correct sizing of the shiploader. 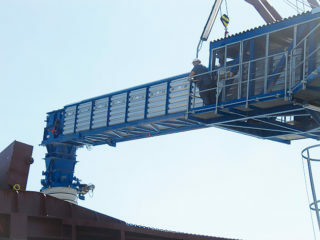 HL700 Shiploader is manually operated by a mobile remote control. Electrical equipment room is delivered as a separate container which can be freely located to an optimal place. HL700 Shiploader is equipped with electrical and mechanical safety devices to protect operators and structures. The Shiploader is delivered according to European Machine Directive. HL700 Shiploader is equipped with its own MCC/PLC and HMI, thus enabling easy connection to the plant control system. 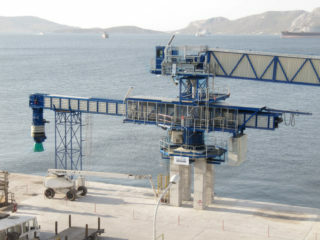 Automatic lubrication system, dust suppression or collection system, operator’s cabin, receiving chute with support structure, cascade/telescopic chute, tower for parking/service/storm locking, lighting system, CCTV system, standard ATEX classification, preassembly of Shiploader superstructures.